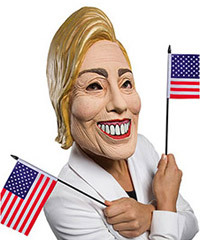 Well-known for his Hollywood movies, politics, big muscles, and tabloid scandals, the legendary film star, former California Governor, and now the new host of NBC's Celebrity Apprentice, bodybuilder Arnold Schwarzenegger is the perfect celebrity to satirize for Halloween night! 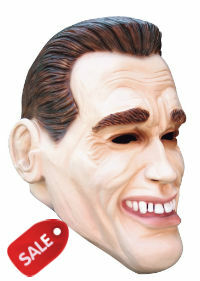 These Schwarzenegger masks will get you instantly recognized during Halloween with actor's exaggerated facial features such as prominent chin, teeth, forehead, and hair. 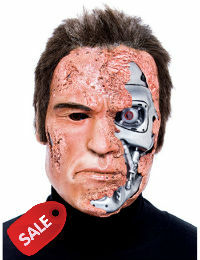 Play homage to The Terminator and Conan the Barbarian by disguising yourself as this over the top movie character actor. Inspired by the movie series, you can complete your out futuristic assassin outfit with this killer android mask. 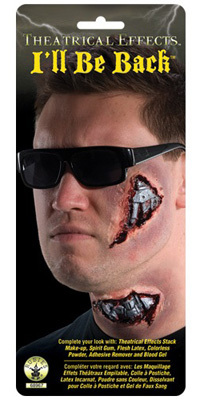 If you are a fan of sci fi movies and the Arnold, you will want to dress up as The Terminator for Halloween. This includes the Terminator jacket with shoulder metal snaps, front down zipper, skull on the sleeves, and attached belt. Also, sunglasses and fingerless gloves with metal studs are also included. Available in men size large or extra large (XL). This makeup kit includes hand painted latex appliances with flesh, blood, and cybernetic painted details. 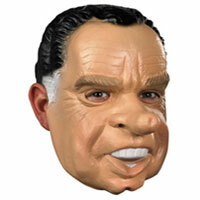 This Arnold Schwarzenegger mask will get you instantly recognized during Halloween with actor's exaggerated facial features such as prominent chin, teeth, forehead, and hair. 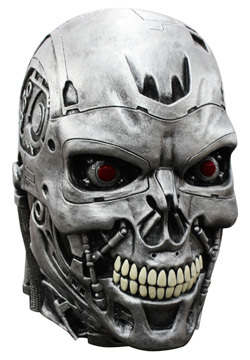 Whether you are a fan of the original or the new 2015 Terminator Genisys reboot, this detailed Terminator movie mask will suit your needs in becoming the next cyber humanoid assassin for Halloween.